Working at the computer can sometimes be a daunting and repetitive task, but it shouldn’t affect your health! Proper hand and wrist position is just as vital to your overall health and well-being as is the proper sitting posture. Here’s a few tips on how to achieve the proper position for your hands and wrists, and why this is so important. According to Mayo Clinic, carpal tunnel syndrome is a condition that affects the hand and arm of a person due to over-use or consistent, repetitive motion of the wrist and arm. The carpal tunnel is a small passage located inside your hand, on the palm side of the wrist, which contains and protects the primary nerve that delivers blood from your heart to the tendons in your hand. This allows you to bend and move your fingers. When this passage becomes compressed, it typically leads to tingling, numbness and weakness in your hand and fingers. Keep the keyboard placed directly in front of you with the mouse positioned next to it. Position the mouse so that, while using it, your wrist and arm are straight. Your wrist should not bend, nor should you need to reach for the mouse in order to use it properly. If possible, purchase a desk that includes a keyboard tray. Keep the keyboard and mouse on the keyboard tray. 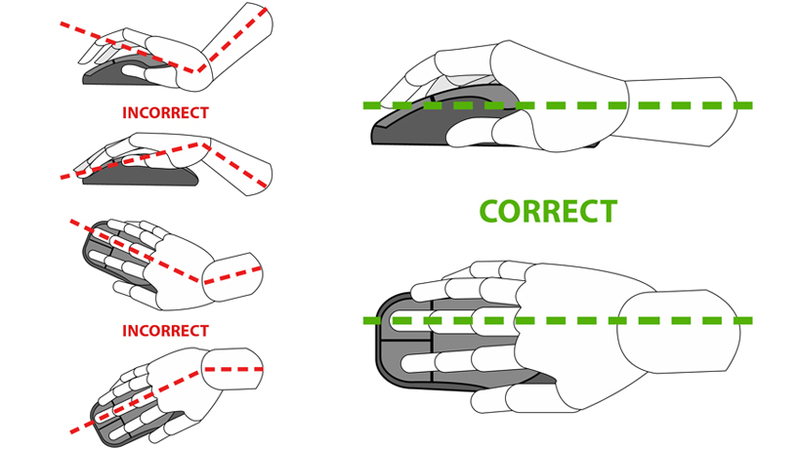 If sitting in the proper position, this will help you to maintain proper hand and wrist position while using the mouse and keyboard without even realizing it! Consider purchasing a wrist rest to use with your mouse and keyboard. In addition to these tips, you should also be aware that bending your wrist in an awkward position for any reason while working on the computer for extended periods of time, whether its bending it sideways or upwards, will put you at a potential risk for developing carpal tunnel. Alternative mouse and keyboard options may also help prevent pain, discomfort, and the onset of carpal tunnel. If you’re in the market for a new mouse or keyboard, consider purchasing a mouse with a trackball and a split-key keyboard. A trackball mouse will give your wrists and hands the added comfort it needs when scrolling, pointing, and clicking; and a split-key keyboard will help you to position your hands correctly over the keyboard for easy, pain-free typing. According to the Center for Disease Control and Prevention (CDC), an estimated 3.1% of Americans between the ages of 18 and 64 had carpal tunnel syndrome in 2010. Don’t be a statistic! Take care of your wrists and hands now; follow these tips to help prevent against this condition.